Low cost, yet fully commercial licenses are offered during your education and research projects. Specialist licenses available for Students, Lecturers and Researchers looking to use Easy-PC in the lab or in the classroom. Pricing bundles are available for 1, 3, 5, 10 or more systems. Please contact us to discuss the Educational pricing available to you. Everything in Easy-PC has been designed with ease of use in mind. In most cases, the main menus are hardly used with shortcut menus being used in all contexts. Try it and see for yourself. 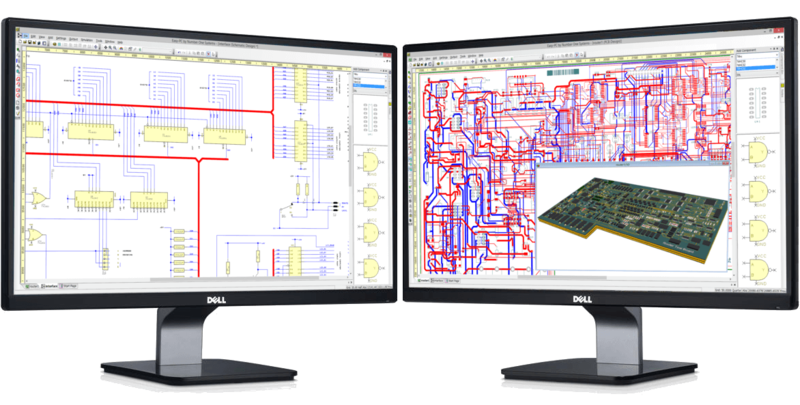 Library creation wizards enable you to create Schematic Symbols, PCB Footprints and Components simply and efficiently. Wizards guide you step-by-step through a sequence of operations resulting in the automatic generation of new library items, simply and efficiently. The Design Rule Check examines your designs and checks for a number of possible errors to help you avoid downstream problems in generating the layout. Easy-PC provides you with all the standard manufacturing outputs you would expect from a professional product; Gerber, DXF/IDF, Excellon NC Drill, Windows, Pen Plot, ODB++, BOMs, Parts lists and Pick & Place outputs. Please complete this form and we will send you a copy of the Easy-PC trial version. Items marked with * must be completed. I wish to download my free unlimited-time trial version and agree that Number One Systems may contact me from time to time by email or phone for further information or to provide me with marketing, technical and other information. I understand that if I agree to this, I can unsubscribe at any time in the future. How we use your data.